I’ve had an interest in getting on bands above 6m for quite a while, but for various reasons I’ve tended to stall out in the process and never complete the projects. This time, though, I set a hard deadline of January 22nd to have a working 220 MHz SSB station. 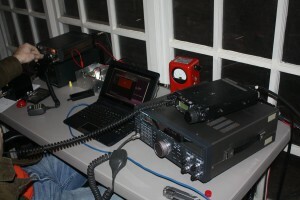 The project started when a friend found a transverter board online by W7BAS that uses a 144 MHz IF. This is convenient because I just got a Kenwood TR-9000 2m rig for Christmas this year, and it’s of the variety that can be easily modified for transverter operation. I purchased the board, and got it about two weeks ago. I have to complement Bruce for his board design. Unlike some boards out there, significant thought was put into the kit design to make it easy to assemble. Not only does the board have labels for all components, but the kit comes with all components in individually labeled containers so that one can keep track of parts really easily. 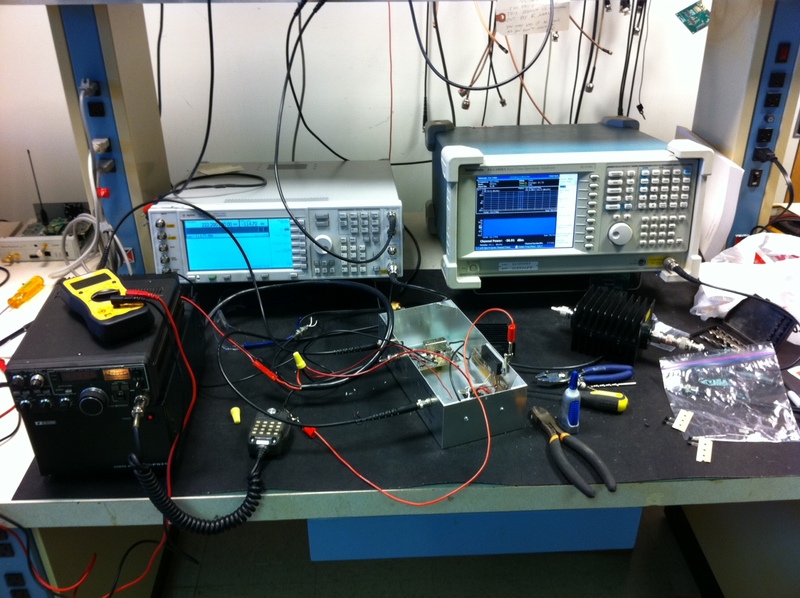 No components were smaller than 0805, which made assembly extremely easy with a SMT solder station. I’d imagine it would be much harder without a fine tip soldering iron and magnifying glass, though. I had few problems with the board after assembly. I discovered later on that the receive MMIC amplifier was not receiving bias, but that was due to a mis-soldered RF choke. The board is designed with performance in mind. The receive path has a 222 MHz three-stage helical filter immediately following the mixer to filter out LO and IF leakage (though the third harmonic of the LO is still a potential issue at 234 MHz), and the LO, RX, and TX paths have small filters inline after each amplification stage to keep the signal path clean. I have not done a formal spurious response analysis, but undesired signals appear to be at least 25 dB down from the fundamental at 222 MHz. After fixing the receive preamp, I found sensitivity down to CW signals (as measured by ear with the TR-9000) to be good to at least -136 dBm, and possibly better though I did not try. Drive from the transverter is also very good with output power better than the specified 10 mW, though I did not record actual CW values. I will do this next time it’s on the bench. A transverter isn’t much good with drive in the milliWatt range, though, so I purchased an M67712 power module from RFParts. 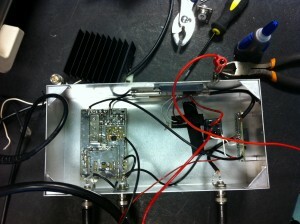 It cost around $85, and can in theory make close to 30W with linear amplification (Class AB, not C). The module is easy to use, with RF in, RF out, bias, and ground terminals. I used a specially designed board with it, but I don’t know that it would be strictly necessary for good performance. Due to drive issues from my Kenwood TR-9000 (read: too hot! ), I can only get to about 4W output before I run the risk of damaging the transverter. 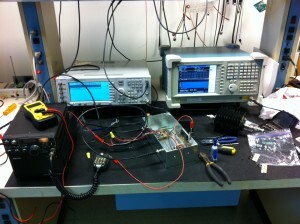 I found that the entire system, with the power module, makes about 20 dB gain from IF drive power. That is to say that the 222 MHz output power is 20 dB higher than the 144 MHz IF drive. 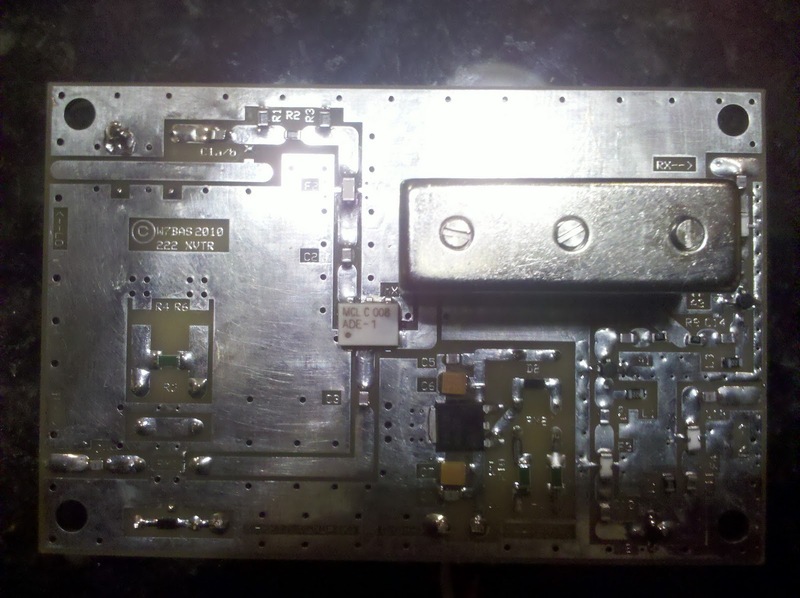 To complete the package, I used a G6Y relay with a W1GHZ board for T/R switching, and bundled the thing in a metal box I got from a friend.